Are you caught up in our consumerism society? 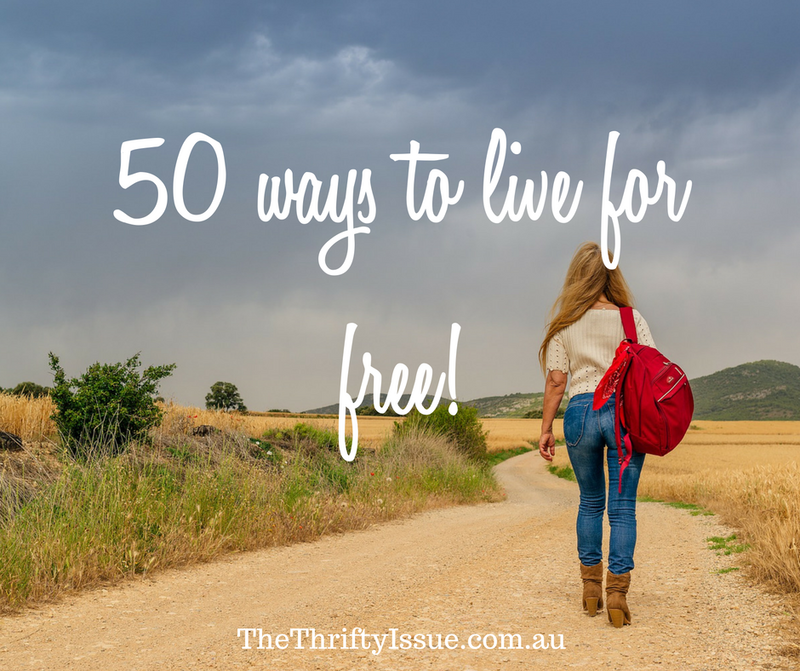 Do you think living for free or trying to live frugally is just too hard? It is so easy to think you need to upgrade, buy everything new, pay for the expensive play centres for your kids, dates need to be dinner and a movie and there is no way you could possibly live as a family of 4 in a standard 3 bedroom house. Having been in some dire situations such as my ex husband losing his job when we were married with a mortgage and 2 young kids, being a homeless single mum because of domestic violence and being robbed one year right before Christmas, I know how little I need to get by. It also enabled me to learn how to get many things in life for free. When redoing your budget or looking at ways to save money, have you ever looked at each section in your budget, everything you do and pay for in your life to see how you can do it or get what you need for free, instead of just thinking about how you can cut back? Get creative and you can save easily. Learning to substitute ingredients and invent meals will make it easier, but did you know there is a lot of free food available too? Look around your local area, use Google and learn about edible plants then go forage for them. Be sure to check if they are sprayed by the local council though. If you see any overloaded fruit trees, ask the owners if you may pick some. I know a few people who have done this with apricots, oranges and apples. Take notes when out walking or driving around of places you see fruit trees and other edible plants. Only do it with permission though, don’t steal them! It’s not free to set up a vegetable garden and fruit trees plus it costs you money to water and take care of them, but it’s pretty close to free once established. Start with herbs, shallots, celery, lettuce and similar vegetables which you can grow from scraps with your groceries. You can buy them from the supermarket, cut off what you will use then place the ends in water to make them sprout and grow then plant them. It turns your scraps into more vegetables! Some offer free food, others charge a fee. Only use food banks if you need to because they are there to help those in need. Check your local area, ask charities and check with your local Centrelink office if they have a list of any services like this in your area. Bartering is swapping something for something else where you both benefit, for example, services such as gardening, babysitting or ironing can be swapped in exchange for food others grow, or you could swap food you grow with food others grow. In general, you want to swap things that are of equal value so everyone is happy. Numerous companies will pay you to do mystery shopping at places including supermarkets, cafes or fast food joints. I did this for a while years ago resulting mostly in pizza (up to $30 value) or $20 for the local supermarket. You need to go in the time allocated, run through what they need you to do then do a survey. It can be a fair bit of work for small return at the beginning but once you get some experience, you get offered higher paying gigs sometimes even free flights. Any store that has a vip club or membership usually has a birthday special or freebie such as Sumo Salad, Boost, Subway or Cold Rock to name a few. We have a complete list of VIP clubs and reward programs for Australia here. Enter competitions and giveaways everywhere from blogs to magazines, the radio and Facebook. Learn to fish if you have somewhere close by you can go. It’s not free to start with unless you get given a rod and gear or get it from freecycle, but over time pays for itself. Social Soup is the one I have used the most and had drinks, chocolate, yoghurt etc. Usually $20 to $50 worth, plus once I was paid $125 to give my opinion on milk. Free food comes with a catch, you have to write about it or share it on social media etc. Always interesting to try new foods first, though. Try a vagabond lifestyle and see how you go with couchsurfing, house sitting, pet minding and other free accommodation options. It does mean you don’t have one specific place to call home, it saves thousands a year though. Again, bartering works for accommodation too, especially if you’re single! You can clean the house to pay for living there instead of paying cash or make other arrangements such as cooking or if they are elderly, they might be interested in being driven to appointments, some cleaning and cooking as well as company. Look up ‘demi pair’, as they do some childcare and light house duties in exchange for accommodation. If you have spare space in your house, rent it out. There are many people who rent out a room to boarders, exchange students or on Airbnb. In some cases you can offset the entire cost of your home, making it free for you to live in! Check out this post on how to make your mortgage pay for itself. There are numerous site dedicated to house sitting or you could try Gumtree and similar sites. Most have pets they need you to care for as well as the gardens, mail and property. You can even get paid to do this. Willing Workers On Organic Farms is what WWOOF stands for. A worldwide opportunity for working on organic farms. You can travel around, stay on farms and take care of the land. You can get free furniture from so many places such as items people place on the kerb (depending on the legalities in your area), Freecycle, Buy/Sell/Swap groups and even Gumtree. A simple Google search will tell you what is on in your area or check the events section on Facebook. Various councils have free events at times which can include free pool entry, competitions, fireworks, BBQ’s and more. Where I live there are free festivals and events every weekend. You don’t need to join a gym! Running, swimming at the lake, river or beach, bush walking or even free Tai Chi are all great forms of exercise that don’t cost a thousand dollars a year. Some Meetup groups offer free yoga, pilates and other exercise or check out free offers from gyms, sometimes you can get up to a month free, without signing up. You can get paid to review events. Contact magazines, newspapers, blogs and search around for anyone who is looking for content. Or start your own review blog and after building an audience you will get lots of free opportunities. Enter competitions and giveaways. It can be a great way to show off a talent of yours, possibly win prizes or try something you haven’t done before. I have had the best success with giveaways on blogs. Borrow books and magazines, use their school holiday activities and most libraries have free wifi too. Or for books alone, check to see if there are swap meets in your area or mini libraries where you leave one and take one without needing a library card. They are not free to install, but if you are staying in the house you have bought for a long time, they will pay for themselves. Again, they are not free to start with, but they will save you money over time by providing you with free water. Plus, check free sites all the time, I know a few people who have gotten tanks this way. If you can’t afford a tank, you can collect water in buckets, old bins and other containers to use on the garden. Be careful though, stagnant water will grow all sorts of things and are a breeding ground for mosquitoes. Cafe’s, shopping centres and libraries all have free wifi, as do most city centres now, allowing anyone to access the internet at any time. Be careful of cyber security when accessing free wifi though. Stop paying for phone calls and use VoiP or Skype instead. I haven’t had a home phone in years and have at times gone without credit on my mobile by using free wifi and Skype. There are various websites you can sms for free from. I did this when I went to the USA to message some friends back in Australia. Most only allowed one or two free texts, but it saved me a lot. Use private messages to chat with people, set up online events and invite people instead of posting invites and utilise all the tools social media has for communication to reduce postage and phone expenses. Organise a clothing swap with friends and family or look to see if one is happening in your area. This goes for your clothes, your partner and kids clothes. It is amazing what people have grown out of or bought and never worn. Pull out your sewing machine and refashion some of the clothing you have. It doesn’t have to be refashioned for yourself, you can turn old shirts into dress for your daughter, capes for the kids to dress up with and more. My kids get holes in the knees of everything they own, so now when that happens we cut them to turn them into shorts, which they love because they can be longer than most of the shorts available in stores for girls. If you are in need you can get free clothes from various charities or vouchers for their stores. But if you are just looking for free stuff, consider the local tip shop. Many of them have free clothing. Some of my friends have really nice brand name dresses that came from there and you would never have guessed it. Many beauty counters, beauty salons and even beauty brands online offer samples. Send away for them or request them in person to use instead of buying them. Various beauty companies have at home parties you can host to get free products and have a pamper session with your friends. This goes for almost anything you want to buy from kitchen appliances to home decor now too. Many salons are looking for models for different treatments or services they offer. It can be risky but if you aren’t overly committed to your hair or nails as they are, it can be a great way to save money. Grab a ride with others to and from work. Either alternate who drives, try bartering for a different service or if you are good with cars you could service their car in exchange for rides. If you have a credit card you can rack up travel points easily. Make sure you know where to shop to get bonus points and accumulate them for something worthwhile. I know I mentioned it for food, but you can also get free flights, accommodation and attractions as a mystery shopper. You need to prove yourself with smaller jobs before you will get bigger ones like these. Also check out 29 ways to make money travelling, even as a family! Look for free print offers, often available for your first 50 photos at larger stores. If you are good with your money, having a rewards credit card will help you accrue points to cash in for rewards such as cash back, travel or products. Also, FlyBuys, EveryDay Rewards and the huge list of options for other reward/loyalty programs we have here. Let them accumulate throughout the year then cash in when you have enough points. There are a lot of online survey sites you can do surveys about everything in exchange for cash or gift cards. While it’s more like working, you won’t make much and it would be classed as a hobby, it can provide gift cards you can use for things and money you wouldn’t have otherwise had. We share how you can make $1,000 per year with a couple of Australia’s best online survey sites here. It won’t make an item completely free, but it will get you some of the money you spent back. Do a search for anything you are looking to purchase and use Cash Rewards. Check out bank offers as well, with many offering fee free accounts if you deposit over a certain amount or cash back when you sign up. If you want something for free look in the free sections of places like Gumtree or in Facebook groups. It’s amazing what people give away. You can educate yourself on many things for free online, and if you aren’t specifically after a qualification, but merely interested in the subject, some universities have their entire degrees online for free. Otherwise, there are always scholarships as well. There are groups on Facebook you can join for your local area that offer free stuff, or some are just for swapping, others are buy, sell or swap. Or let friends and family know what you are after and see what turns up. I have mentioned this for a couple of things like food and transport but you can barter for virtually anything. I have done it my whole life and it works well. You don’t need to pay for music. Instead, you can set up playlists to listen to music with Sound Cloud, Youtube or a variety of music apps. Embrace the whole free living lifestyle, including dumpster diving for food and other items. I haven’t done dumpster diving myself, but when I was homeless, you can bet I looked for everything I could that would be free instead of buying. Easter, Christmas, birthday’s, Mother’s Day/Father’s Day and similar are usually rampant with consumerism. Instead of buying everything, try gifts of time or service, decorate with nature such as pinecones, seashells etc. Use the kids artwork for gift wrapping and send an email/newsletter to everyone instead of individual Christmas cards. Don’t volunteer just to get free stuff! If you choose to volunteer there is usually the benefit of free meals if you are in a kitchen, free products and the option of selecting items if you are working in an op shop. Whenever I have told people things I am looking for, it has been amazing what has been provided or offered. Someone might be throwing out exactly what you need. I have practically furnished an entire house this way before, got a sewing machine and loads of other things. How close to living free do you think you can go? How many of these ideas do you do already, or would you like to implement? What do you do that’s free? Originally posted 8th Feb, 2014. Republished 22nd November, 2016. Great tips – particularly like number 4 as it applies to so many areas of life, business etc. Wow! Amazing post, I love it! The best things in our lives are always free – love, happiness, friendship, memories…I absolutely agree that we stucked in consumerism and living our lives to raise more money and then spend more money.